All City of San Antonio web sites, including but not limited to www.sanantonio.gov, www.sanantonio.gov/GIS, www.alamodome.com, www.sanantoniocvb.com, www.visitsanantonio.com, mysapl.org and sapl.sat.lib.tx.us are provided as a public service. PLEASE NOTE that users of these web sites are responsible for checking the accuracy, completeness, currency and/or suitability of all information. The CITY OF SAN ANTONIO makes no representations, guarantees, or warranties as to the accuracy, completeness, currency, or suitability of the information provided via these web sites. The CITY OF SAN ANTONIO specifically disclaims any and all liability for any claims or damages that may result from providing any of the City of San Antonio web sites or the information it contains, including any web sites maintained by third parties and linked to the City of San Antonio web sites. The responsibility for content rests with the organizations who are providing the information. The inclusion of links from these sites does not imply endorsement by the CITY OF SAN ANTONIO. Specific questions regarding any content should be directed to the appropriate organization and not necessarily to the City of San Antonio. The CITY OF SAN ANTONIO makes no effort to independently verify, and does not exert editorial control over, information on pages outside of the City of San Antonio domains. The CITY OF SAN ANTONIO does not endorse any of the products, vendors, consultants, or documentation referenced in these web sites. Any mention of vendors, products, or services is for informational purposes only. 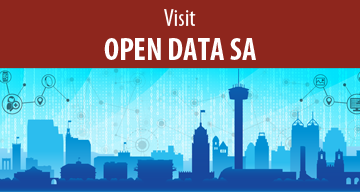 The CITY OF SAN ANTONIO does not collect or track personal information from the City of San Antonio web site visitors except where specifically indicated on the relevant "pages." Generic information from server logs may be used to track and analyze the number of hits to the site, and to find out what types of browser software are used by visitors. This information will be used only in aggregate form, and used solely for improving web site design. This site uses a secure server for conducting online transactions. All credit card and other payment information that you transmit to the City will be protected by a minimum of 128-bit encryption technology, provided your web browser is properly configured and your computer is operating properly. Security technology requires that you are utilizing a reasonably current web browser that is capable of a minimum 128-bit encryption. Current web browsers provide visual cues to the visitor that the online service is secure. Such visual cues include the use of a key or lock symbol in the browser. A visitor should always ensure that the symbol being utilized is unbroken or locked prior to transmitting any personal information to the site. A broken or unlocked symbol means that a visitor should not trust that the site is secure or that it is safe to transmit personal information. User's sensitive information is only used for its intended purpose. Your credit card information is not stored in our database and the payment information is encrypted before it is transmitted for processing. The City limits access to sensitive personal information* to authorized personnel only. All authorized personnel are kept current on security and privacy practices. For more information regarding the security of personal or business information, please contact the Information Technology Department. * Sensitive Personal information means an individual's first name or first initial and last name in combination with any one or more of the following items, if the name and the items are not encrypted: (i) social security number; (ii) driver's license number or government-issued identification number; or (iii) account number or credit or debit card number in combination with any required security code, access code, or password that would permit access to an individual's financial account; or information that identifies an individual and relates to: (i) the physical or mental health or condition of the individual; (ii) the provision of health care to the individual; or (iii) payment for the provision of health care to the individual. “Sensitive personal information" specifically excludes publicly available information that is lawfully made available to the public from the federal government or a state or local government.